SpaceX is go for launch. The private space-flight firm is planning a test flight on 2 March of its Crew Dragon spacecraft – a version of its cargo-ferrying craft modified to carry astronauts, though it will only carry a dummy astronaut for this launch. The spacecraft will launch early in the morning from Kennedy Space Center in Florida. If it is successful, it will demonstrate that SpaceX is capable of safely shuttling astronauts to space. US astronauts have relied on Russian Soyuz rockets to get to and from the International Space Station (ISS) since 2011, when the US space shuttle programme shut down. Crew Dragon will have one astronaut dummy on board, named Ripley, that will be fitted with sensors to monitor the forces human crews will feel on future flights. The spacecraft will dock with the ISS on 3 March and undock on 8 March, when it will return to Earth and parachute into the Atlantic Ocean. “That is something we have to practise in preparation for crewed flight to make sure we’re fast in the right spots, and have all the potential medical attention at the right time,” said Hans Koenigsmann at SpaceX, in a briefing on 28 February. The weight of the cargo on board will mimic that of a crew, said Kathryn Lueders, who manages NASA’s Commercial Crew Program. The Falcon 9 rocket that will take the Dragon Crew capsule to space will detach and return to Earth, landing on a drone ship in the ocean, said Koenigsmann. Shireman said the ISS crew will be in the cupola, a domed module with windows all around, to watch as Crew Dragon attaches to the station. When it is connected, the astronauts will board the ship, unload cargo and swap it for samples from ISS experiments that will be returned to Earth. Roscosmos, the Russian space agency, had previously expressed concern that there was no back-up control system for the SpaceX craft in the event of a collision with the ISS. So rather than designing extra software, NASA agreed to take additional steps to protect the station and the astronauts during docking, including closing extra hatches and having the crew ready to leave in the Soyuz capsule that is used for returning to Earth if something started going wrong. 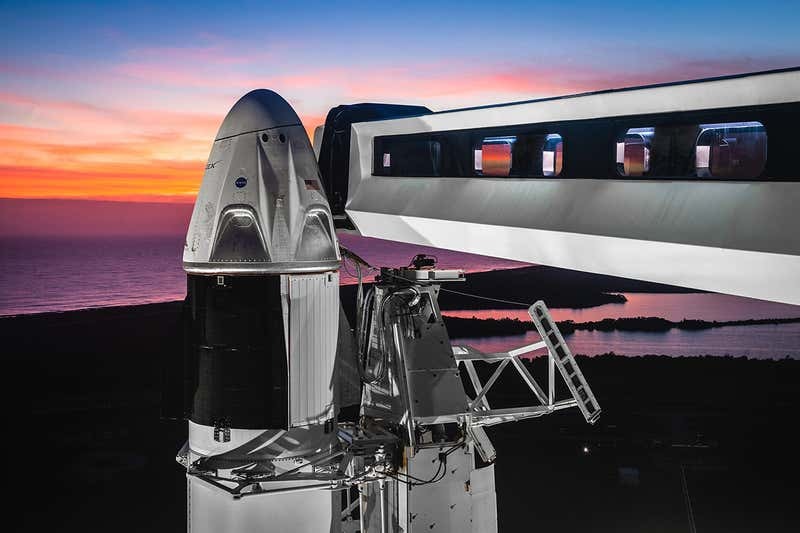 The Crew Dragon spacecraft will dock with the space station through an adaptor that was ferried up to the ISS on a SpaceX rocket in 2016. This will be the first time that docking adaptor has been used. If the flight is delayed it will launch on 5 March.